​When I was considerably younger I thought a life reviewing records was a noble ambition. I imagined that record companies would fall over themselves to send me slabs of vinyl on a daily basis and my job would be to spend a couple of hours a day tapping away at my typewriter, bashing out pithy bon mots before retiring to bed with a bottle of bourbon for company. I’d earn enough to buy my mother a bungalow, my father a road map that was published sometime in the 20th century and still have change to buy a hot hatchback. Life took a very different path and music became a pastime, an escape from the daily grind. Fashions in music have come and gone, my own tastes and preferences broadened and never once have I regretted not pursuing that fantasy. To the casual reader it appears simple but how do you really do justice to an artist’s work, the album they’ve sold possessions to get recorded, honed in innumerable soulless pubs in return for a warm beer and stale sandwich, written on breaks at work and completed at night after long shifts? If you don’t like what they’ve produced that’s your problem, until you put pen to paper when it becomes theirs; their hopes, dreams and integrity written off because it doesn’t meet the expectations you place upon them. Then again if you love it how do you convince people to buy it, to invest in them, to contribute a fraction of its worth in order to appreciate their time and passion, the arguments, pain and risk that has gone into it? How do you persuade a world used to music manufactured to sell advertising on TV that the real talent on a Saturday night is playing in a draughty hall down the road not on the screen in front of them? The answer is of course being that I haven’t tried. Daunted by the task and too self-conscious to risk crossing the line between enthusiast and fanatic I have steered the safe path and just applauded from the sidelines. But occasionally you meet people on the way who are just too talented to be overlooked and have too much integrity to sell out and fit into the mainstream. I’ve written about some of them occasionally, Songdog and The Domestics made it into a recent blog entry. Phil Burdett, Ags Connolly and The Anatomy of Frank are worthy of a mention in dispatches too – why not enjoy a crafty Google when you're alone and check them out. 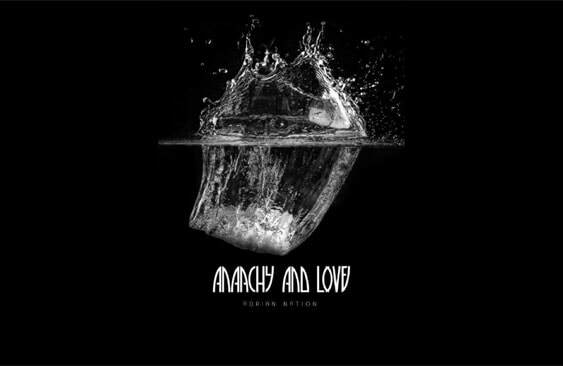 But right now my attention is focused upon Adrian Nation, who has just released his fourth album Anarchy and Love and it has captivated us. 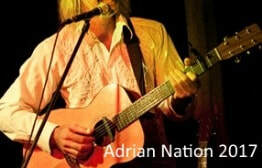 If you are not familiar with him Adrian is a singer songwriter of extraordinary talent with a flair for virtuoso guitar playing and insightful, heartfelt lyrics. The last time I saw him play live was on the Hebridean island of Mull. It was an appropriate setting for him, a rugged and sparse land, rich in history and legend. 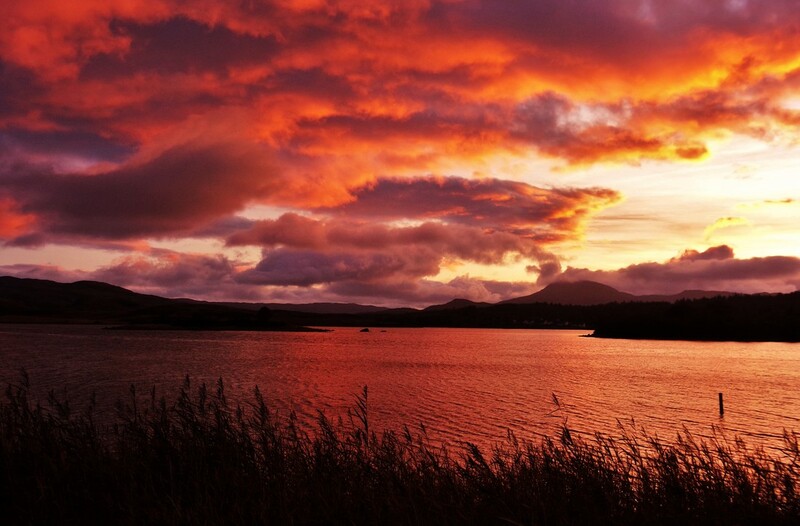 A few months later I was listening to Anarchy and Love while driving through Mull in the autumn and there couldn’t have been a more suitable soundtrack to accompany hills covered in rich sepia tones and bathed in pale sunlight. It’s fitting that Anarchy and Love was released in the autumn, a time of deep colours and rich textures, of contemplation and reflection. Adrian has captured the essence of the season with thoughtful lyrics wrapped around luxuriant melodies. He’s no slouch on the guitar and the impressive musicians he’s brought on-board quietly and confidently add depth to the music. Adrian chooses to open Anarchy and Love with Runrig’s Rocket to the Moon. His version cuts to the essence of the song by scaling down the stadium anthem pomp of the original, giving the words room to breathe. Of his own songs some, like Benderloch Stone and Dying of Democracy, have been in his live repertoire for a while, gradually evolving from raw acoustic tunes to the full band versions on the album without losing the intimacy of those solo performances. The title track has become one of my favourites, a passionate meditation on, as the title suggests, anarchy and love, born from his experiences during tense times in Athens, Greece, as was Dying of Democracy. Both songs convey a sense of anger and confusion at the tensions on the street with the internal turmoil of witnessing violence in response to injustice. Elsewhere we get three classic solo guitar tracks, more than mere interludes, each one a bridge between the tracks either side of it. On Carpe Meridianus (look it up, I had to) he especially shines; a gently building instrumental piece that demonstrates his dexterity and restraint on the 12 string guitar. Talent isn’t always what you put in, often it’s what you leave out; the courage and self-assurance to leave spaces, to play with joy and not to show off. It’s a treat to listen to something as complete as Anarchy and Love. Though in an age of streaming and downloads, it’s an album than spans both worlds, classic album and 12 individual tunes. Of the 12 tracks on the album there isn’t a single filler, each works on its own and as a piece of the album as a whole. The most intimate of Adrian’s feelings are channelled into these songs, no more so than on Last Goodbye, about the death of his father. If that sounds like a recipe for melancholy, then it isn’t. In Adrian’s own words ‘…until that moment I had no idea that death could be beautiful, but it was’. As autumn herald’s the waning of the year and colours fade in the chilly air we can choose to look ahead, prepare for the spring and create a new season from the ashes of the old. Anarchy and Love is the perfect soundtrack to accompany the season. Can I convince you to buy it though, to pay less than you would for a takeaway meal so that you can own something that will endure long after the take-away cartons have been discarded? I hope so; real music takes time and patience, hard work, false starts, hopes dashed and money spent with no certainty of return. Do yourself a favour and head over to his website now; you can even listen to some tracks for free. ​Adrian and I first crossed paths a few years ago. I opened my front door to a bedraggled urchin standing in the drizzle selling portions of cheesecake door to door. He cut a pathetic figure then, gaunt and unfeasibly tall with nothing but a guitar slung over his back and a bag of cheesecakes to his name. But somewhere under the grime of this wayward street urchin I could tell there was a spark, a tiny pilot light of hope keeping him going. From that day on I’ve followed his career with interest. Although I didn’t know it then he had already enjoyed a brief flirtation with fame. His career in music started when he was 13 years old as part of Clacton based boy band Squelch. In spite of some early local success he quickly outgrew his band mates, literally, leading to his sacking when he grew too tall to fit in the band’s publicity shots. But misfortune was to catch up with Adrian again soon when Solomon was caught smuggling books into Essex and was deported back to his native Wiltshire. Undeterred by the absence of his mentor Adrian started gigging at local pubs and clubs, living off the fruit and veg punters would toss at him. At one such gig a chance encounter with his former Squelch bandmate Robin led to Adrian’s next big opportunity. Robin was looking for a way to avoid paying tax on some of the millions he’d made with Squelch after Adrian left. Robin financed the release of Adrian’s first CD Sewing Machine. Despite positive reviews in the Clacton Evening Gazette, who called it “The only album we’ve received this week” and in the Jaywick Times who said “Adrian Nation has released a CD” the album didn’t sell as well as hoped but his follow up Falling Fly reached a wider audience and was shortlisted for a coveted East Anglian Daily Times MOCO (Music of Celtic Origin) award in the newcomer category, losing out to the newly reformed Squelch with Slash (Guns n’ Roses) taking Adrian’s former place on guitar. Downhearted in losing out to his former band-mates and disenchanted with the music business Adrian decided that his solo career wasn’t working out so he split with himself, citing musical differences. Disillusioned and with a 20 a day plectrum habit to support he took to the stage to earn some money, playing Sleepy in Clacton Amateur Dramatic Society’s production of Snow White and the 7 Dwarves. This came to an abrupt end when someone explained to him what amateur meant. He followed this with a spell on the festival circuit as a scrotum juggler. But the lure of the music industry proved too much and I ran into him again when he played at my wedding. I’m not sure why, nobody asked him to. Still somewhere under the matted beard and incoherent mumbling he seemed in reasonable spirits and told anyone who would listen that he was soon to become a TV star. If we all thought that was just the ravings of a fantasist then we were too polite to say, so imagine my surprise when a fresh faced Adrian turned up on a TV talent show on an obscure cable channel. Although he didn’t win he did well and on the back of this success he turned up in Edmonton, Canada. It turned out that he had boarded the wrong bus after leaving the TV studios in London’s Oxford Street. Ever resourceful he managed to secure the backing of the UK Foreign Office who arranged some bookings at festivals and clubs for him in exchange for two crates of maple syrup and a moose called Nigel. Thus he spent the summer touring Canada and building up a loyal fan base, who both chipped in to help towards his air fare home at the end of the summer. The last time I met Adrian he’d just returned to the UK and I asked him for an interview, but all he would say to me was “Hey, who are you and what are you doing in my bedroom?” The reason for his secretiveness may have been because he’d been busy recording his 3rd album, Anarchy and Love. And what a sumptuous package it is. Who’d have thought that scruffy child sticky with homemade cheesecake would one day put together a release of this stature. The wonderful cover photo is embossed onto a stylish plain black background, the lyric booklet is tastefully illustrated with unobtrusive photos and the whole package comes in a classy tri-fold CD wallet. It wouldn’t look out of place on the coffee table next to the John Lewis catalogue and Duchy of Cornwall biscuits. ​Oh, and there’s some music on the CD too. Disclaimers: Most of this is lies. The rest I made up. ​Any similarity to persons living or dead, with the exception of Adrian obviously, is purely coincidental. If I've inadvertently stolen someones Grindr handle I'm sorry. Good question. A while ago, with Adrian's consent, I put up a spoof biography about him. At the time of writing I was listening to Anarchy and Love and enjoying every note. I have now finally got around to writing something approaching a review. I was listening to Anarchy and Love and considering writing a review when my mind, never my most reliable organ, started whirring off down a different track altogether. This is the result. It's certainly different from the review Adrian expected. Some of it is very loosely based upon real events but I'll only tell you which bits in return for cold hard cash. Usually our blog has been to record our adventures for family and friends after my wife and I packed in our jobs and took to the road. This page is an offshoot of the main blog which you can find here if you feel so inclined.